Winsor & Newton Graphic Artist Pigment Marker Pen Sets. This listing offers the choice from the range of Pigment Marker Pen Sets. 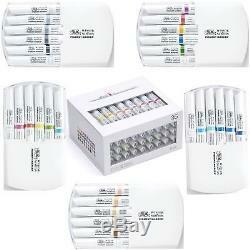 W&N PIGMENT MARKER 36 SET. With 36 assorted colours split out into four at-home storage trays, this set provides the most comprehensive insight into the full Pigment Marker Colour spectrum. From Lemon Yellow Light to Indigo, and Linen to Mauve, choose any of the 34 colours to work alongside either the White Blender or Colourless Blender and explore endless colour possibilities. Explore its unique blending properties on Winsor & Newton Pigment Marker Paper. The set comes in an interlocking case, so you can steadily build your Pigment Marker collection and easily attach two, three or more sets. W&N PIGMENT MARKER 6 SET VIBRANT. For the most vibrant representation of the full Pigment Marker colour spectrum, we have curated a set to include Phthalo Teal Light, Sap Green, Lemon Yellow, Scarlet and Magenta (Red Shade). The free White Blender that comes with this set opens up further colour possibilities, extending the tonality of each shade and allowing full colour graduation. For maximum vibrancy and effortless blending, use each colour with Winsor & Newton Pigment Marker Paper. With its interlocking case, you can easily attach this set to others, building your Pigment Marker collection at your own pace. W&N PIGMENT MARKER 6 SET COOL GREY. Encompassing the full spectrum of Pigment Markers in Cool Grey, these five shades blend all the more effortlessly into one another when used alongside the free White Blender. W&N PIGMENT MARKER 6 SET SKIN TONES. A range of skin tones can be explored from Portrait Pink to Burnt Umber. Also included are Light Sienna, Parchment and Burnt Umber Light. Each of the colours can be used alongside the White Blender, free with this set, to explore further shades. W&N PIGMENT MARKER 6 BLUE TONES. Attach this set to another with its interlocking case, and build your Pigment Marker collection at your pace. W&N PIGMENT MARKER 6 SET RICH TONES. With a sumptuous representation of five sections of the full Pigment Marker colour spectrum, the set of six Rich Tones is a versatile introduction to Pigment Marker. Use Mauve, Carmine, Winsor Yellow Deep, Phthalo Blue Deep and Emerald alongside the free White Blender to explore myriad colours and effects. For optimal blending performance, use the colours on Winsor & Newton Pigment Marker Paper. We will ensure that your products are packaged safe and secure and will reach you in the most efficient way. For damaged or faulty items once a return is authorised we will pay for the cost of the return and look to resolve the matter to your satisfaction. The item "Winsor & Newton Graphic Artist Pigment Marker Pen Sets" is in sale since Saturday, May 21, 2016. This item is in the category "Crafts\Art Supplies\Drawing & Lettering Supplies\Art Pens & Markers". The seller is "artworldonline" and is located in GLASGOW. This item can be shipped to United Kingdom, Austria, Belgium, Bulgaria, Croatia, Cyprus, Czech republic, Denmark, Estonia, Finland, France, Germany, Greece, Hungary, Ireland, Italy, Latvia, Lithuania, Luxembourg, Malta, Netherlands, Poland, Portugal, Romania, Slovakia, Slovenia, Spain, Sweden, Australia, United States, Russian federation, Canada, Brazil, Japan, New Zealand, China, Israel, Hong Kong, Norway, Indonesia, Malaysia, Mexico, Singapore, South Korea, Switzerland, Taiwan, Thailand, Chile.